We Have a Winner and a Runner-Up! Response to our Recipe Contest was unbelievable! Well over 200 mushroom fanciers took part, and there were no ringers (“start with a can of Campbell’s ‘Cream of Mushroom’ soup and add…”) among them. 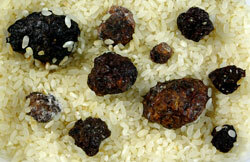 Most were sophisticated recipes with ingredients and exotic spices to match, and they came from as far away as India. We prepared many of them, and were mightily impressed. 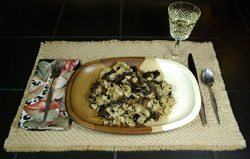 Recipes ran the gamut, from desserts to appetizers to main courses; they used a wide variety of mushrooms, with only a few choosing the standard white grocery store agaricus. One of these, however, turned out to be a close runner-up to the eventual winner; while not often our choice, these ubiquitous super market mushrooms do have their legitimate place. Something we did not expect, but which truly gratified us, was the very personal aspect of many of them. Most were accompanied by a notation, such as, “This is my husband’s favorite recipe,” or, “We fix this dish for gatherings at our place for football games.” In this way, we found ourselves connecting with our entrants as we read their notes. We try to make this a very personal website, and that connection with our readers is a “big deal” for us. This was a very tough decision, and we agonized over it for days. Still, there can be only one winner, and for us, that winner had to be Becky Reams of Los Angeles. Her Papardelle with Balsamic Mushrooms recipe (which follows) included portabellos and morels, with an option to add scallops and was, exactly as she wrote, easier to prepare than it looked, hearty and with a rich depth of flavor like its been cooking all day, but it really comes together very quickly. A nice prize package of goodies from our part of the world will soon be on its way to LA, along with our congratulations and thanks for entering. The package includes, along with other items, Patrick Masterson's A History of Port Orford and Heck Timeus' Rogue River County as well as a bag of One Horse Coffee Company's House Blend, 'Tis Tasty's pickled vegetables and jam, ol' Hippie Gourmet BBQ Sauce, Siskiyou Mountain potpourri, and Gold Coast handmade soaps and Gardener's Healing Hand Lotion. Enjoy! The Cauliflower Mushroom – Sparassis crispa – is our absolute favorite wild mushroom ever, bar none. There. We’ve said it. And while we do not doubt that many of our readers will have different thoughts, this is a highly individual choice, and Cauliflowers are ours. Why? 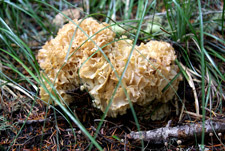 First and foremost, they are absolutely delicious – their heavenly mushroom fragrance, their borderline “crunchy” texture (as their Latin name implies), and their full-bodied flavor stand alone among many truly remarkable rivals. They are never plentiful, so finding them never gets “ho-hum.” And they are truly spectacular when encountered, resembling nothing else, and they are often huge in size. We will forgive the fact that they’re sometimes difficult to clean; their ruffles are ideal places for fir needles and debris to fall into and stay put. They are well worth this minor inconvenience. If you’re lucky, you’ll find them on a nice day after a few days with no rain or wind to blow this debris into them. Luck is a prime requirement for finding them at all. The literature discusses individual specimens to 40 pounds and more. I hope we live to see such a brute, but for us, ones like the very first one we ever found would make us deliriously happy to find any day of the week. Even though that occasion is more than a quarter century behind us, we both remember it as vividly as if it was yesterday. In those years, we were really just starting out, and Mary often went hunting while I was occupied with fishing. This was a day like that. We were on a favorite stream on Oregon’s north coast that just then was playing host to good numbers of bright Coho salmon which, unfortunately, were resolutely refusing every lure I cast their way. I was climbing out of a small canyon to seek out more cooperative fish, when I saw Mary heading my way. She was carrying something, but for the life of me, I couldn’t tell what it was. As she neared me, my puzzlement mounted, particularly since I could now see how excited she was. It was a cauliflower mushroom, absolutely picture perfect, that turned out to weigh an honest 16 pounds. I’d never seen one, other than in books, and neither had she. It had been growing on a stump, as is so often the case (it’s reported that they invariably grow on wood, normally either stumps, roots or the base of trees, and always conifers), and when she saw it she stopped dead in her tracks, as if taking one more step would startle it into flight. It was a truly shocking discovery, and we both agree that no matter how many we find, they remain so to this day. She carefully cut it away from the stump with a knife, being careful to leave a generous amount of the base attached to the stump as her pocket guide recommended (such care is sometimes rewarded by future “finds” in the same place! ), and carefully lugged it back to the car, and to me. I must admit that I was as excited about her remarkable prize as I had been at the sight of any of the bright fish I’d spotted earlier that day. The heady fragrance filled the car as we headed home late that afternoon. We didn’t know then that Mary’s wonderful find would become a lifelong passion, but it did and it has. We religiously return to places we’ve found them before, but have only found a new one growing on the same wood once. Still, though, they are more likely to grow in the same general areas, so this strategy has paid off for us. They are rare enough in most years, though, that specifically targeting them and planning a foray around a search for them is usually not a good strategy; they grow where they want to grow, and if you are lucky enough to find a nice one, you can feel justly proud of yourself. Grateful, too. One further comment we often make about hunting technique seems worth repeating here. You would be surprised at how easy it is to “miss” a large cauliflower that just happens to be growing on the other side of a tree or stump, completely hidden from view. Don’t race through the woods, and every once a while, turn around and look back. You’ll be surprised at what you’ve missed. No matter how tired you are when you get home from your foray, check them over thoroughly. Any decay or rot will quickly spread, and the same goes for bugs and worms. Absent either of these two problems, they will keep well in a cool, well-ventilated place for a couple of days. This is a prize not to be squandered. Cauliflowers need to be cooked thoroughly in order to make them properly tender (would it be proper to use the term al dente?). 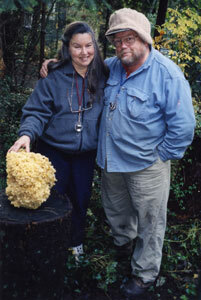 Consistent with this, Alexander Smith described them as resembling a “bouquet of egg noodles,” as the esteemed David Arora reports in Mushrooms Demystified. Smith’s description seems about right to us, but however you would describe them, we are certain you’ll agree that they are nothing short of magnificent! Dehydrating is a great way to preserve cauliflowers. January is the Oregon Truffle Festival and their annual dinner...an event that we consider every year asking ourselves: "should we" or "shouldn't we". But with dinner prices at $160/person we always decide "maybe next year". Just imagine my pure delight when Shirley Freeman walked into the office a week or so ago carrying a large tray filled with black and white Oregon truffles that Doug Moore had given her! With a generous spirit, Shirley was sharing the truffles. Steven and I had the good fortune to be blessed with 2 large Oregon Black Truffles and a handful of Oregon White Truffles. What a treat! What a truffle feast followed at the Taylor house!